IF THIS GOLD INGOT WOULD BUT SPEAK! 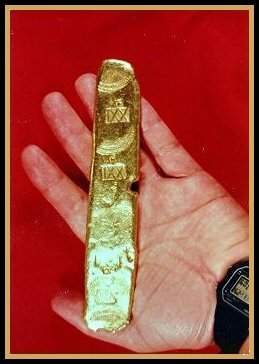 by Ernie Richards, ©1988 Of all the gold bars found to date on the trail of Nuestra Señora de Atocha, none is more magnificent or mysterious, and none has been more popularized, than the one called “EN RADA”. The ingot does speak, of course, through its myriad markings—impressed by ancient hands—but its complete story remained a partial secret for years after its discovery. Diving from the salvage vessel Southwind in September of 1974, diver Hank Spinney recovered the EN RADA bar in the “quicksands” area near the Marquesas Keys...with his bare hands, the first modern hands to touch the bar since it settled in repose 3-1/2 centuries earlier. What a thrill it was to him, and what a relief to Mel Fisher, his researchers, and his investors! Not only was this an exquisite artifact, but it was a direly-needed sign that Atocha lay nearby. As much a work of art (by virtue of its magnificent markings) as it is an ingot of gold bullion, the bar’s story unfolds as we examine each discrete stamping. In three locations along its length, the purity of metal (in karats) is indicated as 21-1/4 by the Roman numerals XXI plus a single dot. The dot represents one grano (grain) —four grains equaling a karat. A circular stamp is to be seen at five points on the bar, indicating that the “royal fifth” tax had been paid. If the ingot had to be used as currency before arriving in Spain, it could have been cut into smaller chunks, and each would have signified the purity of the bar and attested to the tax on it having been paid. About halfway along its length, the bocado—assayer’s bite—can be seen as a crescent gouge in the edge of the bar. This was the sample size which he assayed...and then kept as his fee! PLVS VLTRA SITE LINKS WHAT'S NEW? GREAT READING FEED- BACK DEALERS, ETC.